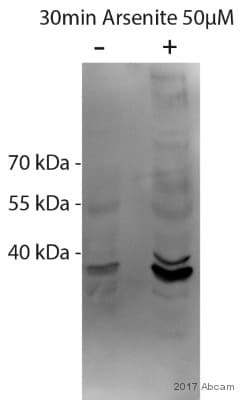 Rabbit recombinant monoclonal EIF2S1 (phospho S51) antibody [E90]. Validated in WB, IHC, Flow Cyt, Dot, ICC/IF and tested in Mouse, Rat, Human, Drosophila melanogaster, Plants and more. 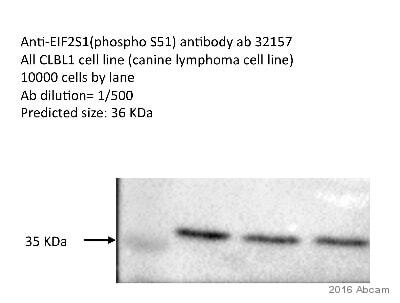 The antibody only detects eIF-2a phosphorylated on Serine 51. Synthetic peptide (the amino acid sequence is considered to be commercially sensitive) corresponding to Human EIF2S1 (phospho S51). IHC-P: Human liver carcinoma, breast carcinoma, cervical carcinoma, colon adenocarcinoma and hepatocellular carcinoma tissues. ICC/IF: Human epithelial cells WB: HeLa cells treated with Clyculin A and phosphatase whole cell lysate; PC-12 cell lysate Flow Cyt: HeLa cells Dot Blot: Antigen peptide. Our Abpromise guarantee covers the use of ab32157 in the following tested applications. WB 1/500. Detects a band of approximately 36 kDa (predicted molecular weight: 36 kDa). Functions in the early steps of protein synthesis by forming a ternary complex with GTP and initiator tRNA. This complex binds to a 40S ribosomal subunit, followed by mRNA binding to form a 43S preinitiation complex. Junction of the 60S ribosomal subunit to form the 80S initiation complex is preceded by hydrolysis of the GTP bound to eIF-2 and release of an eIF-2-GDP binary complex. In order for eIF-2 to recycle and catalyze another round of initiation, the GDP bound to eIF-2 must exchange with GTP by way of a reaction catalyzed by eIF-2B. Belongs to the eIF-2-alpha family. Substrate for at least 4 kinases: EIF2AK1/HRI, EIF2AK2/PKR, EIF2AK3/PERK and EIF2AK4/GCN2. Phosphorylation stabilizes the eIF-2/GDP/eIF-2B complex and prevents GDP/GTP exchange reaction, thus impairing the recycling of eIF-2 between successive rounds of initiation and leading to global inhibition of translation (PubMed:15207627, PubMed:18032499). Phosphorylated; phosphorylation on Ser-52 by the EIF2AK4/GCN2 protein kinase occurs in response to amino acid starvation and UV irradiation. Cytoplasmic granule. The cytoplasmic granules are stress granules which are a dense aggregation in the cytosol composed of proteins and RNAs that appear when the cell is under stress. Colocalizes with NANOS3 in the stress granules (By similarity). Blocking buffer and concentration: 2% BSA/TBST. Diluting buffer and concentration: 2% BSA /TBST. 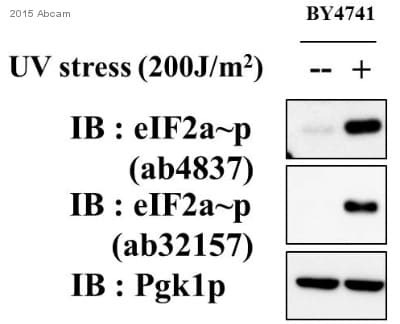 Paraformaldehyde-fixed human epithelial cells labeling EIF2SI using ab32157 at 1/100 dilution in ICC/IF, followed by an Alexa Fluor®647 conjugated goat anti-rabbit IgG. 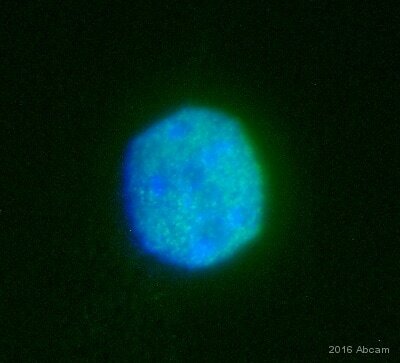 The cells were blocked with BSA before incubation with the antibody for 1 hour. Immunohistochemical analysis of paraffin-embedded human liver carcinoma using ab32157 at 1/50 dilution. 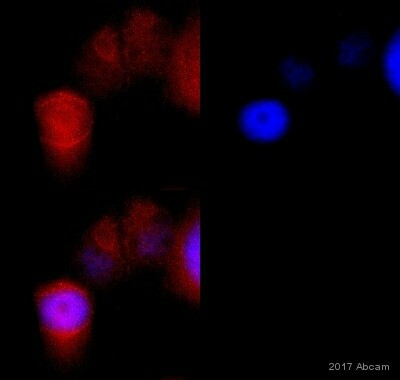 Overlay histogram showing HeLa cells stained with ab32157 (red line). The cells were fixed with 80% methanol (5 min) and then permeabilized with 0.1% PBS-Tween for 20 min. 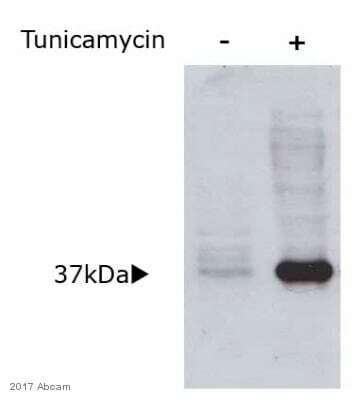 The cells were then incubated in 1x PBS / 10% normal goat serum / 0.3M glycine to block non-specific protein-protein interactions followed by the antibody (ab32157, 1/100 dilution) for 30 min at 22°C. 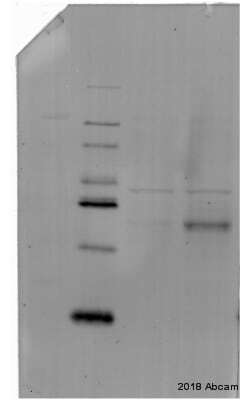 The secondary antibody used was DyLight® 488 goat anti-rabbit IgG (H+L) (ab96899) at 1/500 dilution for 30 min at 22°C. 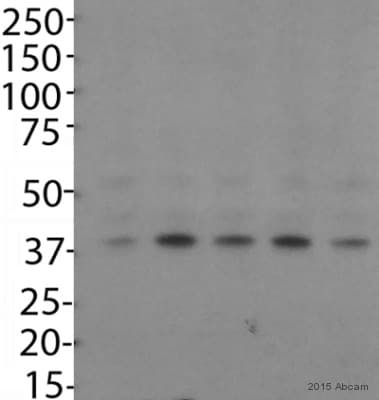 Isotype control antibody (black line) was rabbit IgG (monoclonal) (1μg/1x106 cells) used under the same conditions. Unlabelled sample (blue line) was also used as a control. Acquisition of >5,000 events were collected using a 20mW Argon ion laser (488nm) and 525/30 bandpass filter. Dot blot analysis on antigen peptide. A nitrocellulose membrane was spotted with (1) phospho-peptide and (2) non-phospho-peptide at 5, 1, and 0.1 ng, and then blotted with ab32157 at 1:500 dilution. ab32157 showing positive staining in Breast carcinoma tissue. ab32157 showing positive staining in Cervical carcinoma tissue. ab32157 showing positive staining in Colonic adenocarcinoma tissue. ab32157 showing positive staining in Hepatocellular carcinoma tissue. Publishing research using ab32157? Please let us know so that we can cite the reference in this datasheet.